When an order downloads from eBay the customer details are provided with it so that a record can be created for them. The buyer name will be used for the first and last name, and the eBay username will be recorded in the aliases section of their contact record. If the customer already exists in Brightpearl with the same email address the order will be created against the existing contact record. If any details are different with the order downloaded from eBay those details will be seen on the new order but will not update the existing contact record. If the customer has purchased via one eBay marketplace and already exist as a customer in Brightpearl and the email matches, then the order will be created against the existing customer record. No duplicate will be created where the email matches. There may be times where you recognize a customer (from eBay) who has purchased from you through other channels or through separate eBay Marketplaces and you have a duplicated customer record for them. It is possible to merge these records into one. The email addresses will all be transferred to the retained record (max 3 main emails). If the customer orders via eBay again it will match the customer based on any of the three main email addresses on their record. If the customer updates their details on eBay, for example their name or email address, a new order will still be linked to the same customer record in Brightpearl as long as the email address still matches. If the customer’s eBay email address is changed or removed from the Brightpearl record it will no longer be possible for the integration to match new orders to that customer record, therefore a new customer record will be created. New orders will be created using current details, as provided by eBay on the order download. But the customer record will not be updated in Brightpearl. eBay will send emails to your customers automatically when they place an order and when the order is shipped. Customers who pay via PayPal will also automatically receive an email to confirm their payment has been processed. It is not possible to deactivate these. Brightpearl will also allow you to send shipping confirmation emails (at packing) but it’s not really required for eBay sales. Any other communication can be managed from within Brightpearl. This will ensure all communication is recorded on the customer timeline and you have a full history of what has happened with the order. In order to send emails from Brightpearl you will need to setup your SMTP account. 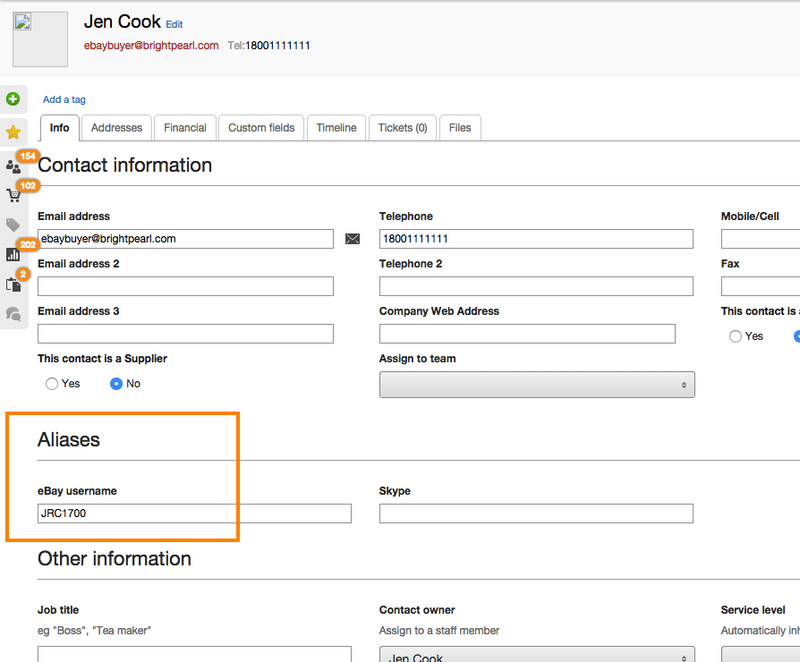 You can send a customer an email by adding notes to the order (mark the checkbox), or you can send bulk emails using batch processing on your sales list. You can find and create new templates at Settings > Templates > System Templates . It's worth noting that Brightpearl is by default set to automatically email invoices to the customer when you invoice the order. If your orders are already paid you probably don't wish this to happen; you can switch it off at Settings > Sales > Sales settings .